Krisi Gindlesperger is the Vice President, National Director of Advanced Practice Providers for USACS. 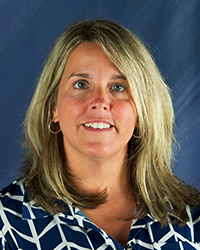 Graduating from Gannon University with her Bachelor of Science and Master of Physician Assistant Studies, Krisi has been practicing as an EMPA for 15 years. Currently, she is in school at Walsh University, completing her Master of Business Administration with a focus in Healthcare. She has worked for USACS for 9 years. Before becoming the VP-National Director of APPs, she has held a variety of leadership positions, including Lead APP of Adventist Healthcare, Shady Grove Medical Center Emergency Department, APP Education Coordinator, Director of APPs Mid-Atlantic Region. Within the previous two years, Krisi has led the charge in developing the APP Academy and onboarding program, developed the APP leadership structure, and worked to ensure the ability for APPs to work at an advanced scope of practice within our departments. She leads the APP program at USACS, leads her team of APP Directors, and interfaces with regional leadership to ensure success at every level. There are nearly 1300 APPs, over 100 APP leaders, and 11 APP Directors. Krisi also sits on the executive team at USACS. Krisi has been deeply involved in APP leadership, leadership development, education and advocacy for well over a decade. Her passion centers around the career development and advancement of APPs in practice both clinically and in leadership roles. She believes the collaboration between physicians and APPs leads to a successful department and company. In addition to her leadership work experience she has served in a variety of volunteer organizations to improve and advance the PA profession. Serving on the Professional Education Commission and Conference Planning Workgroup for the American Academy of Physician Assistants for three years, and on the Board of Directors of the Maryland Academy of Physician Assistants for 13 years as CME Director, she helps further the education of PAs. Krisi also served as Director at Large for the Society of Emergency Medicine Physician Assistants for one year before serving on the Executive Board for three years, of which time she served as President in 2016-2017. Most recently, she has begun collaborating with CHLM of AAPA, offering lectures for the Leadership and Management Certificate program and helping to plan the Executive Leadership Conference. She continues to work closely with ACEP, AAPA, and NCCPA on issues surrounding practice laws, scope of practice, advocacy, education, and other opportunities for collaboration.